Sorry for the bad quality of the photo. My lighting sucked. There's another level to the display case above the three pictured that has some dolls on it but I couldn't fit it in. 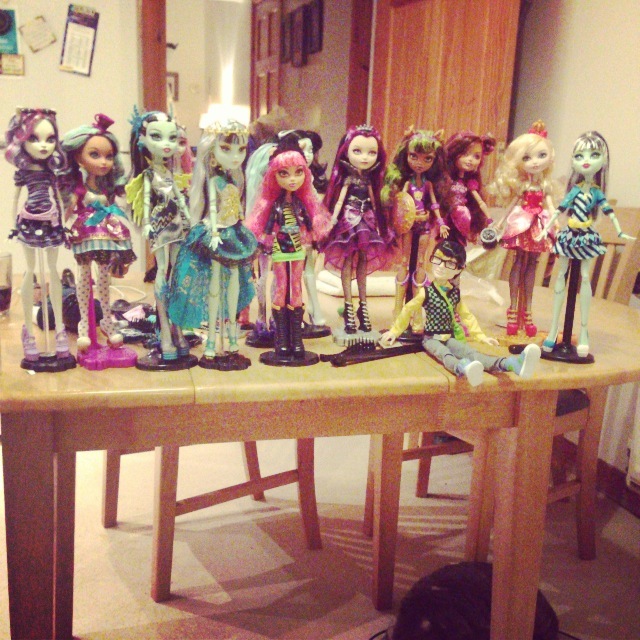 Most of the dolls you can see on the levels pictured are Monster High or Ever After High dolls by Mattel. The ones on the level you can't see are a miscellaneous collection of random dolls I've picked up. 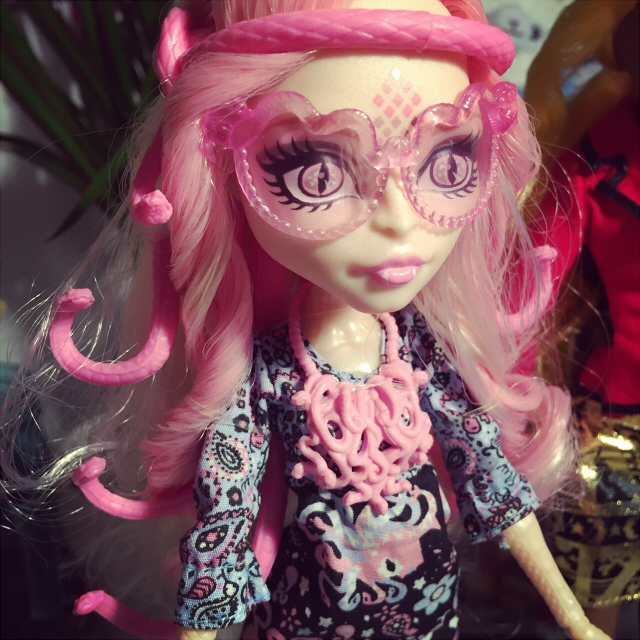 For this post I've decided to concentrate on my Monster High doll collection since they were the ones that kicked off the obsession a couple of years ago when I bought this pretty lady. At the time I was looking into ball jointed dolls and doll customising. I liked the idea of having posable dolls but I didn't want to shell out the money on a proper BJD. 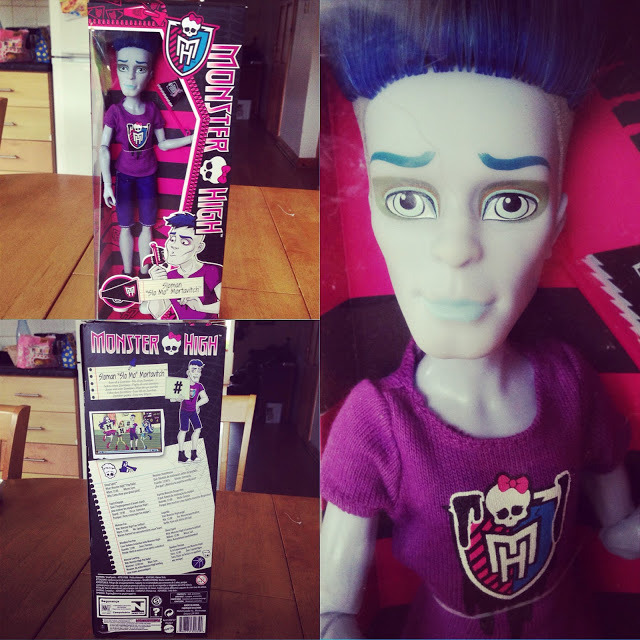 Then I came across Frankie Stein, the doll pictured above, and my inner little goth fell in love. 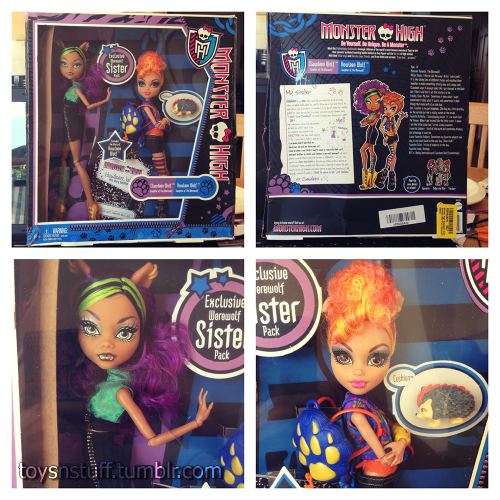 Monster High dolls are beautiful, posable, fashion dolls based on the children of well known monsters. Although they've branched out into more obscure or plain old made up 'monsters' now. 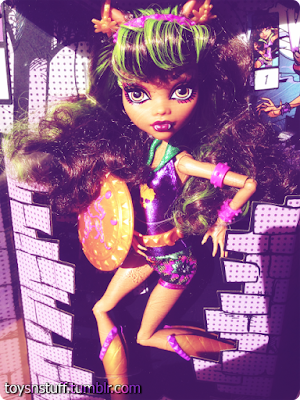 To name a few of the originals besides Frankie there is Draculaura (vampire), Ghoulia Yelps (zombie), Clawdeen Wolf (werewolf) and Cleo De Nile (mummy). Once Frankie arrived my obsession just kind of snowballed. She was just as pretty in person and I was surprised at her high quality considering the low cost. I think I paid £13 for her. For a good few months I was buying multiple dolls a week. When I thought I finally had the ones I wanted, Mattel would release more and I'd be off again. 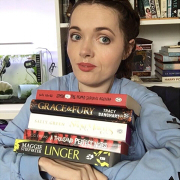 I even started a Tumblr blog to share the experience. There was (or I guess is) a great community of doll collectors on there and I guess in a way we enabled each other, sharing our latest finds and whatnot. Here's some photos of my collection. In total I have around 70 dolls, give or take. I hated removing them from their boxes as I really liked the box art but I just didn't have the space to keep them in them. 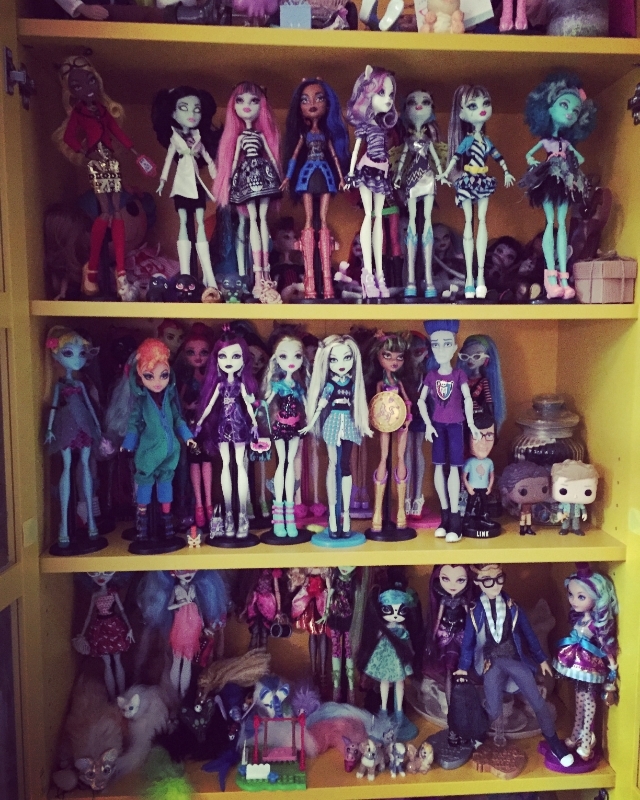 Eventually I didn't have any room for any more dolls either. Luckily by that stage I sort of felt like Mattel was churning them out so fast that the quality was taking a hit and I think they'd gotten a bit lazy with character design. They'd also gotten more expensive. 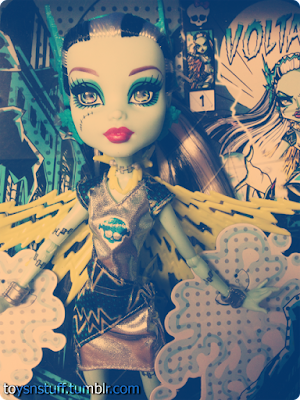 My favourite character, and the one I have the most dolls of, is Ghoulia. She's a zombie and one of the original characters. In the web series she moves super slow and she speaks differently but her friends can understand her. I love her colour scheme and her clothes designs. 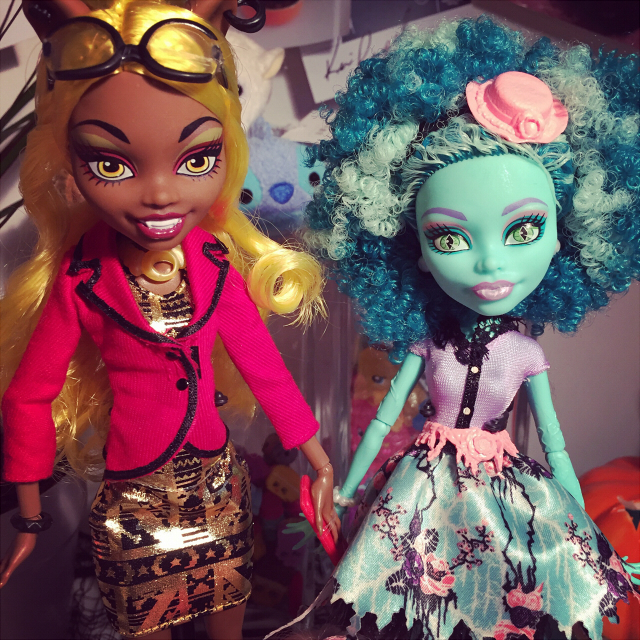 I have another two Ghoulia's but they are incompletes that I had planned to customise at some point but never got around to it. 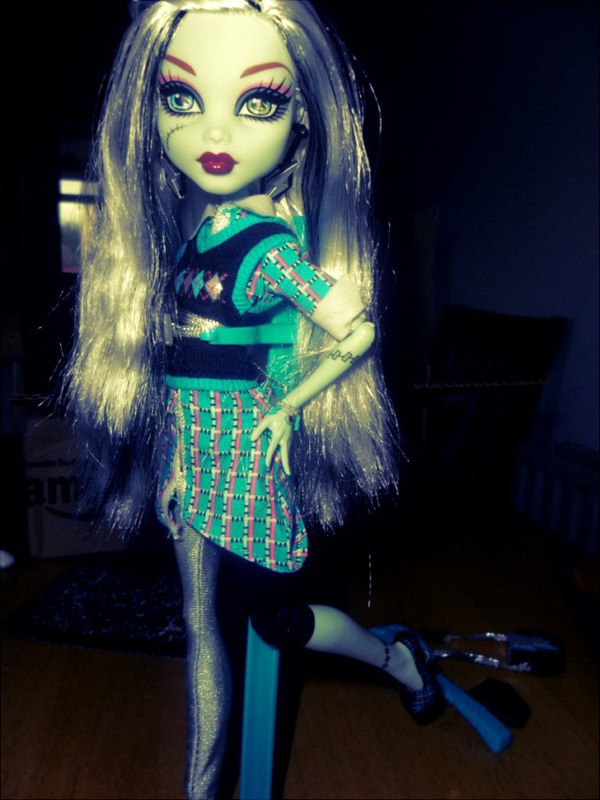 Although Ghoulia is my overall favourite character and doll, my favourite body mould has to be Skelita's. It's almost a shame to make her wear clothes. I'd love to buy a pre-owned Skelita at some stage and customise her too. 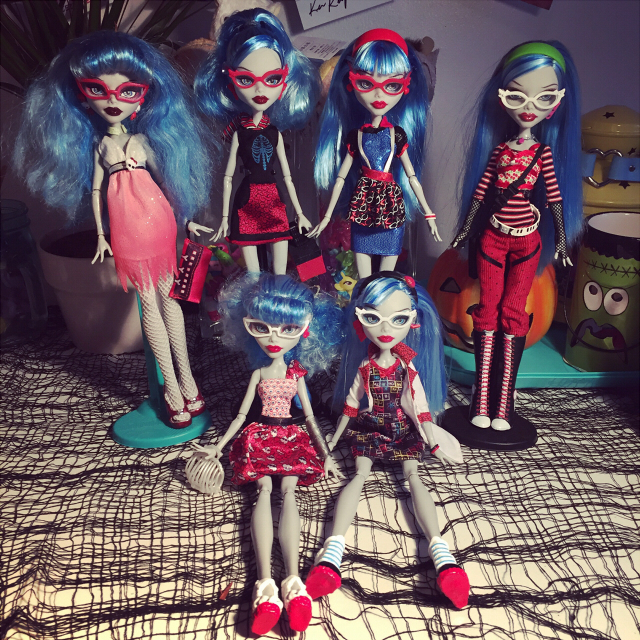 As I said at the beginning of this post this is a past obsession that I'm starting to pick up again, however I mean that more in the doll collection and customisation sense rather than specifically Monster High dolls. 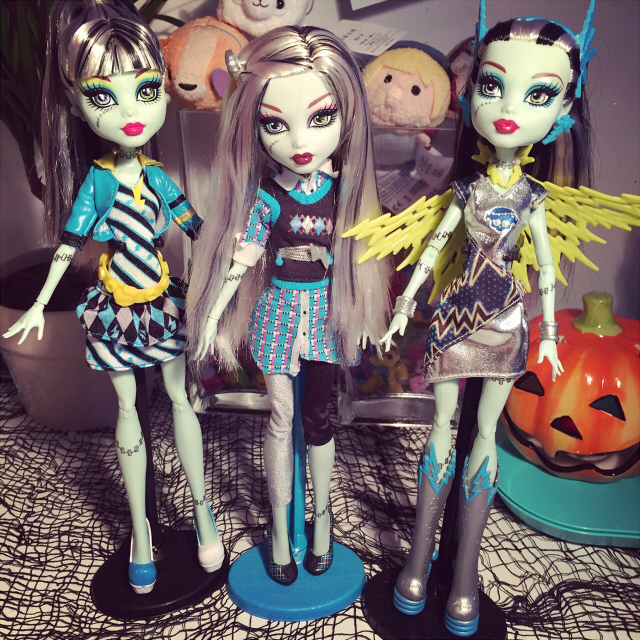 I'm actually thinking of selling off some of my Monster High collection to make room for other dolls but I do plan to keep some and also customise some of my collection. Customising is a hobby that I only dipped my toe into before but something I've always wanted to properly get into. I look forward to sharing it with you guys when I do.